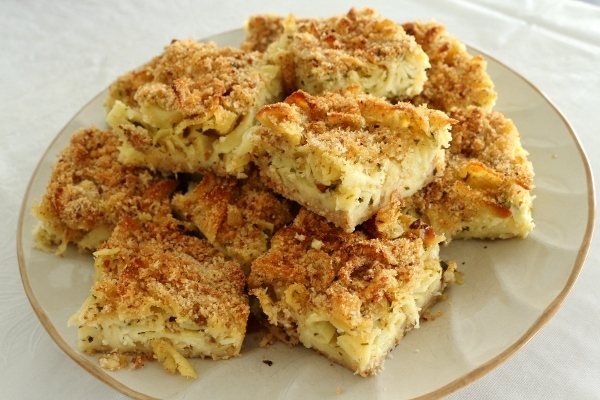 As you may have noticed from some past posts, I love macaroni and cheese. One of my most personally comforting variations is the version my family usually makes, the Armenian one which you cut into squares and serve. 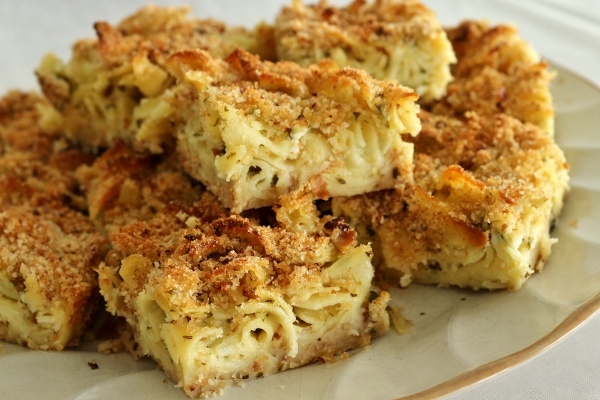 The top and edges get all crunchy between the crispy noodles and the bread crumbs, while the noodles beneath are perfectly al dente, flavored simply with Feta cheese and herbs, and bound together with the addition of eggs. 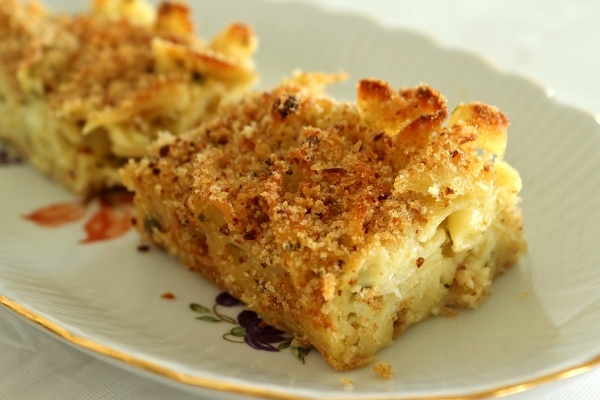 Because this macaroni and cheese is on the firmer size, you can easily cut the squares and then freeze them in a freezer bag for easy reheating at a later time. Delicious! Greek Feta is generally pretty dry and salty. If that's all you've ever had, then it's probably the only flavor you associate with Feta cheese, but there are other Feta cheeses out there! My second favorite Feta is Bulgarian Feta. It's slightly softer than the Greek version (better mouth feel), still a bit crumbly but not as dry. It also has a somewhat briny, tart, and almost rancid taste. I know that sounds like a turnoff, but trust me, it's not. Inside piece... crusty edge piece! My absolute favorite Feta is also probably the most fattening (I've never bothered to actually check because I'm afraid of what I may find). It's French Feta, smooth and creamy. It too shares that briny, tart flavor profile, not the dry salty heap of cheese that is Greek Feta (sorry I'm biased). If I could singularly eat French Feta as my Feta cheese of choice I would, but not only is it more fattening (as much as I chose to believe it isn't), it also costs more, which is why the Bulgarian variety is usually our go-to choice. For this recipe, you can use whatever feta you prefer. The drier Greek-style will grate more easily, but you may get a bit more richness and flavor from one of the other kinds. 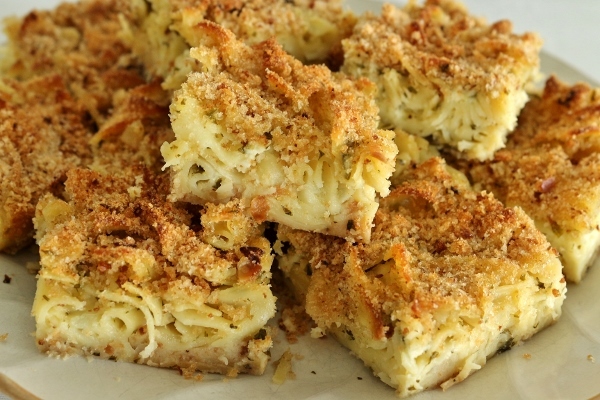 Either way, this is one of my absolute favorite comfort foods, and it's so easy to make. 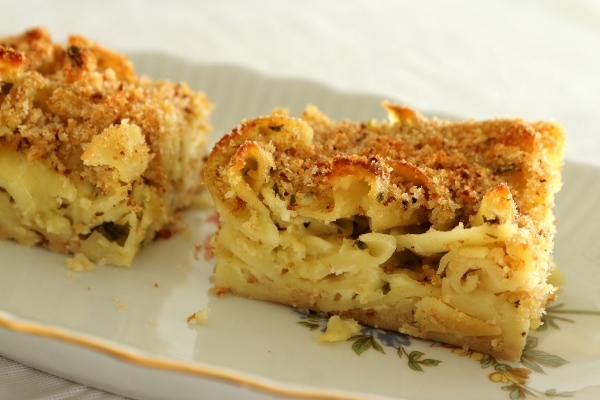 No need to make a white sauce like most other macaroni and cheese. Just mix everything together and bake. It's really that easy! *10/4/15* Post, recipe, and photos updated. Preheat the oven to 360 degrees F. Grease a 9-by-13-inch baking dish or pan with pan spray or butter (alternatively you can use a slightly smaller pan if you want the pieces to be a bit taller). 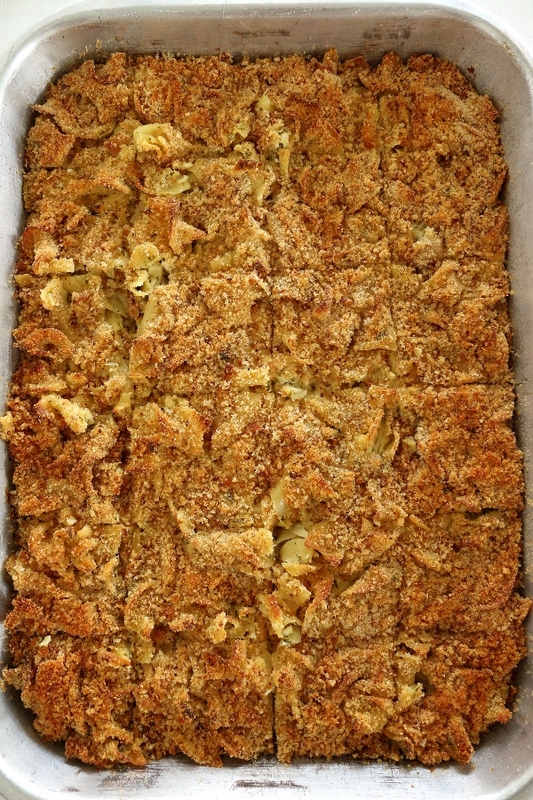 Dust the bottom of the pan with 1/2 cup of the bread crumbs to evenly coat. To a pot of boiling, salted water, add the noodles and cook for about 6 minutes, or until al dente. Drain in a colander and then return to the pot, off the heat. Add the butter and stir until melted. Mix in the Feta cheese, beaten eggs, parsley, milk and some salt and pepper to taste (do not over-salt as the cheese is quite salty). Pour the noodles into the prepared baking dish. Use the back of a spoon to lightly spread and even out the noodles in the dish so they are fairly even. Add the olive oil to the remaining 3/4 cup bread crumbs and lightly toss with your fingers. Generously spread the bread crumbs over the top of the noodles (alternatively you may sprinkle the bread crumbs over the top and use pan spray to lightly grease them, though I find that to be a messy option with crumbs spraying everywhere). 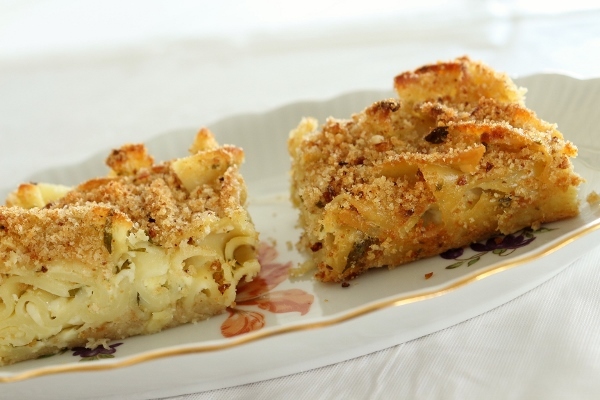 Bake for about 40 to 50 minutes minutes, or until the pasta has set up nicely and the bread crumbs are light golden. Turn on the broiler and broil for a couple minutes to toast the bread crumbs further, so they are a dark golden brown. Remove from the oven and let cool slightly before cutting into pieces and serving (you can get 12 larger pieces or 24 smaller pieces). If making this dish ahead, let it cool completely before cutting it into pieces, and then reheat for service (it will cut more easily when cold). I tried two different flavors of the frozen breakfast pizzas offered by Kellogg. One was Strawberry Granola and the other was Mixed Berry Granola. Both feature a cinnamon-maple crust, fruit and toasted granola. My first impression was that the crust seemed thinner than what was pictured on the box, which is not necessarily a bad thing, because a too thick crust could make the whole experience more doughy than preferable. I tried one using the oven method, and the other using the microwave method to heat. The pizza I baked in the oven turned out a lot better, and had a somewhat crisper crust even though it still wasn't super crispy. The one in the microwave did not crisp up at all, even using the special microwave crisper tray. It was chewy and somewhat unpleasant in texture, pretty doughy. I prefer the oven method by far, even though it takes longer to heat. If you're rushing to eat breakfast in the morning, these are not for you. Heating them in the oven will take time, and even if you forgo texture, and microwave it, it will take a few minutes to actually eat it (you can't easily stuff it in your face on your way out the door like toaster pastries and other fast breakfast items). I was pleasantly surprised to find that it shockingly filled me and kept me full for a lot longer than I thought it would. I imagined I would want a snack an hour later (based on its size) but it definitely kept me full until lunch time. I will give it credit for that! Would I buy these on my own? Probably not. They were pretty tasty, but I don't think I would seek them out in the future, especially since the microwave (faster) method yielded poor results (in my opinion). I do give Eggo lots of credit for creating a unique breakfast product. I've never seen frozen breakfast pizzas in the freezer section, so I think it's great that they are branching out and trying new things. I received two flavors of the cereal as well, Berry Yogurt Crunch and Cinnamon Oat Crunch. They contain 40% and 35% of your daily fiber requirement respectively. I can honestly say I really enjoyed them both. The Berry Yogurt Crunch stayed crunchy for a long time in my milk, and had a nice light non-sugary sweetness that wasn't overwhelming (like some other too sweet cereals). I liked the yogurt bits and the "fruity crunch" element in there with the flakes, and wouldn't have minded at all if they had included more :) I loved the Cinnamon Oat Crunch as well. It reminded me of a less sweet Cinnamon Toast Crunch, which is a personal childhood favorite. This is obviously much healthier, full of fiber, and a lot less sugar. I was recently the lucky winner of a cheesemaking kit from Panini Happy! 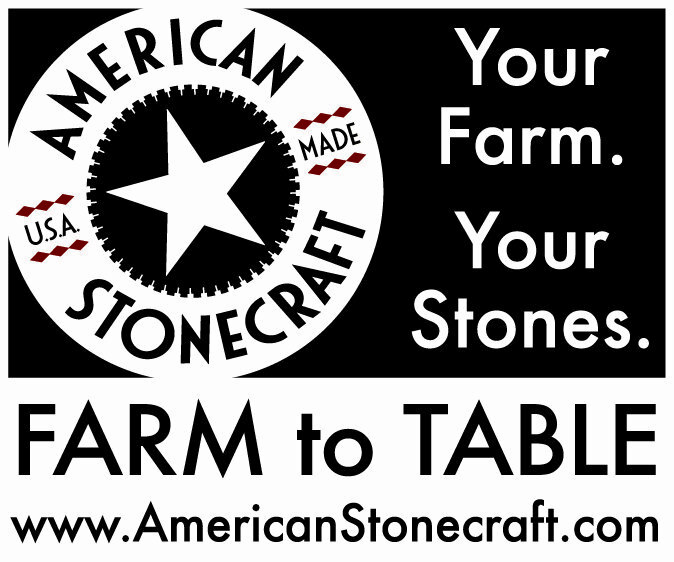 Upon receiving my awesome prize, I ventured out to buy some "special milk" (not ultra-pasturized, preferably local) to make my first attempt at mozzarella cheese, ended up with some local Rhody Fresh whole milk from Whole Foods, and then took my cheesemaking kit and got to work. I was nervous, but followed all the directions to a T. My milk curdled beautifully, though it took a little longer than it said in the recipe to get a firm enough curd and clear (not milky) whey. I cut the curds and then continued heating my curds and whey for the specified amount of time while slowly stirring. I drained off the whey, split my curds into two halves (to shape two mozzarella balls), and got a hot water bath ready on the stove to heat and stretch my cheese. This is where I had some issues. My first batch that I heated started to come together and stretch, but I thought it wasn't quite stretching enough so I heated it more, and apparently too much because it completely fell apart. Oops! Time for my second attempt. I heated it in the water bath just long enough to soften up the proteins enough, bring the curds together and stretch the cheese, added some cheese salt, and stretched and worked it just long enough to form it into a smooth ball. Now what to do with that delicious homemade mozzarella, you ask? Well, last summer I tried a really amazing dish of Fried Green Tomato Parmesan at Oleana in Cambridge, MA. I got a signed copy of the cookbook from the restaurant, Spice: Flavors of the Eastern Mediterranean, which contains lots of really great recipes, aside from this particular one, and finally got my hands on some green tomatoes from my backyard this summer! I also had a bunch of ripe red tomatoes from the yard, which I used for the sauce, adapted from the book as well (I changed it to use fresh tomatoes, among a few other adjustments). The final result, a Southern meets Italian masterpiece. 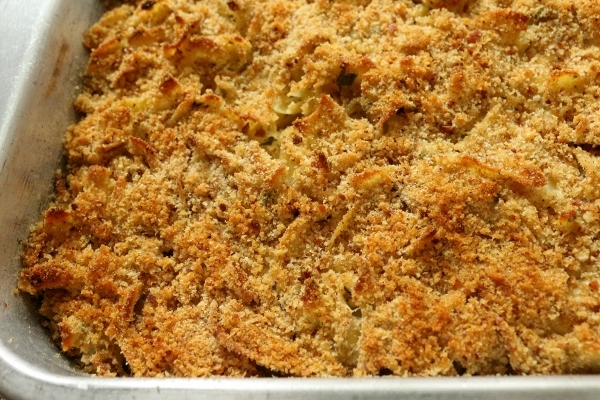 When green tomatoes are available, I would prefer to make this as opposed to another favorite, Eggplant Parmesan, since eggplants are available through most of the year, while green tomatoes must be picked by you or a nearby farm during summer months only, limiting the time frame to enjoy this dish. To make the sauce, heat a large saucepan or pot over medium heat. Add the olive oil, garlic, and chili flakes, and sauté for a minute. Add the tomatoes, salt and pepper, and simmer for about 20 minutes until the tomatoes break down and become soft and saucy. Meanwhile, in a small skillet, melt the butter on low heat and simmer until the butter turns nut brown and smells like hazelnuts. The solids will begin to separate and then fall to the bottom. Butter burns very quickly so watch closely. Immediately remove the butter from the heat and strain through a fine sieve into a dry container. When the tomatoes have simmered for 20 minutes, add the caramelized butter into the sauce and then puree in a blender until smooth. Reseason with salt and pepper and set aside (this will make a scant quart of sauce). Preheat the oven to 350 degrees F. Trim the top and bottom of each green tomato and then slice it into 1/3-1/2 inch thick rounds. The slices should lie flat. Lay them on a cutting surface or tray and sprinkle generously with salt and pepper. Set up three deep trays or mixing bowls, as follows: add the flour to one and season with salt and pepper, add the beaten eggs to one and season with salt and pepper, add the bread crumbs to the last bowl. Dredge a slice of tomato in the flour, shake off excess, then dip it in the egg, shake off excess, then finally into the bread crumbs, coating both sides nicely. Set aside and bread the rest of the tomato slices the same way. Heat 1/4 cup oil in a heavy, large, nonstick pan over medium-high heat. Brown the breaded tomatoes for about 4 minutes on each side, until dark golden brown, adding more oil as necessary to fry all the tomato slices. Remove the tomatoes to a paper towel-lined baking sheet to drain. To assemble, place a layer of fried green tomatoes in a casserole dish in an even layer, slightly overlapped (or arrange one or two tomato slices, depending on their size, in each of several individual baking dishes). Top with about half the tomato sauce and some fresh basil leaves. Then add slices of mozzarella cheese. Add another layer of fried green tomatoes, the remaining sauce, and more mozzarella cheese. 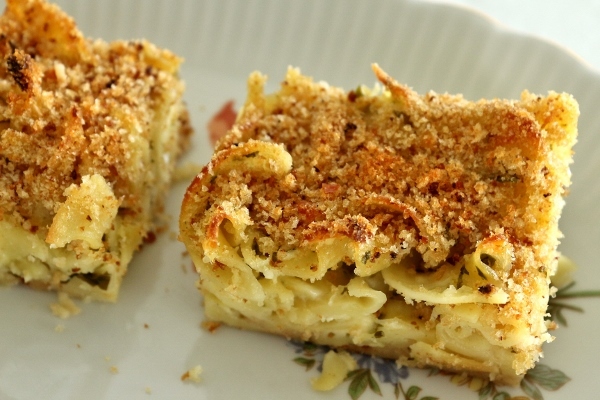 Finish with a touch of grated Parmesan. Place the casserole or individual baking dishes onto a sheet pan and into the oven to bake for about 20 minutes, or until the cheese is melted and the casserole is hot and bubbly. Garnish with more basil leaves and serve immediately. Most people draw hearts in the sand. Or write their names. But I write my blog name, and conduct an impromptu mini photo shoot, because I'm just that cool. When the "photo shoot" was over, my assistant Alex helped me clean up the mess. Don't you just want to bite him? I do!